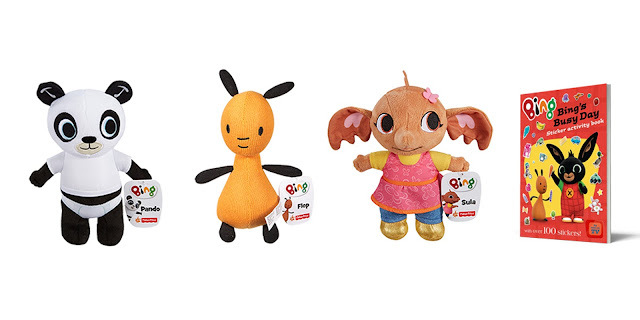 Lily's Little Learners: Its a Bing Thing - Win a My Friend Bing and Goodie Bag! We have watched every episode multiple times. My daughter loves any with the rainybow song! My little boy loves it. Our favourite is the one with the fireworks! But I like the one where Bing gets measured to with his growth chart. We've got a grow chart too so when it comes on, we get to check my boys height too! My niece is a fan, inbetween obsessively watching Go Diego Go (over and over and overrrr lol). I quite like it too although I can't say there's a specific episode that's our favourite hehe. My son loves Bing, his favourite episode is ducks and he laughs his head off when flop blows up the paper bag and pops it to scare off the goose. I know my granddughter loves Bing but I'm afraid it's not me who watches it with her so I don't know which is her favourite. 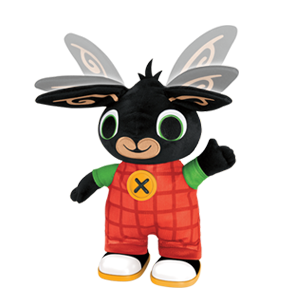 Our little Grandson adores Bing and Flop! a favourite episode involved trying to make a cake in the kitchen which of course didn't go that well! My son loves Bing, his favourite is the one when Bing tries to make friends with his shadow. Yes my little boy loves bing. He doesnt have a favourite, he loves them all! My daughter loves Bing, she tried to shoplift a toy today! I don't know if she has a favourite episode though. I think I've watched most of them with my Niece. She likes to watch the firework one while wearing her own earmuffs. I like the ducks one where the goose eats the food and Flop pops the bag. My little boy and I like to giggle at the bubbles in the bath episode, but we enjoy all of them! My daughter loves bing her favourite episode is the ice cream and fruit kebab one. My two love Bing Bunny. My girl likes the painting butterflies one. We haven't actually seen it yet, but the toys and stuff look really cute. My 3 year old little girl is a big Bing fan! I know she likes the one with the bath and the bubbles! My boys love Bing, but I can't recall a particularly favourite episode. My baby son likes to watch Bing repeatedly but he is too young to pick a favourite episode. He just loves Bing on screen. We love watching Bing! Growing is one of our favourite episodes! We love Bing! Smoothie is our favourite, with Brenda. We like to dance to it! The one with the toilet train! My daughter loves Bing! My grand-daughter loves Bing, she has some Bing board books too! Lil loves the Paddling Pool episode, and also Talkie taxi, ive seen them loads. my fave has to be swing. where bing runs in front of the swing because Pando was on it, and gets knocked over, makes me think - serves you bloody right lol. My godson is a huge fan!! My sincere lives bing and so does my friends 2 year old daughter. This would make a lovely presant. They don't have a favourite episode they love them all. I think they are all his favourites!!! My little boy is a massive Bing fan (i'm quite the fan myself)! Personal favourites are the one where Bing ties to take a Dandelion wish to Sula, but it blows away and the one in Autumn wihen the are collecting acorns and the squirrel keeps taking them! I just love Flop in that hat! We love Bing in this house! Our fave episode is the fireworks one. My 4yo finds it hilarious when Bing puts oven gloves on his ears! My daughter loves Bing, we don't have a favourite episode, but a favourite Bing book: Bing Bunny Bedtime. Ah so many to choose from, but the Ducks and Messy Cake one are favourites of my little peeps :) They are all fab though, a fantastic series! My daughter loves Bing and our favourite episode is Dandelions, I haven't seen too many of them as my daughter tends to watch Bing with her dad when I'm at work!